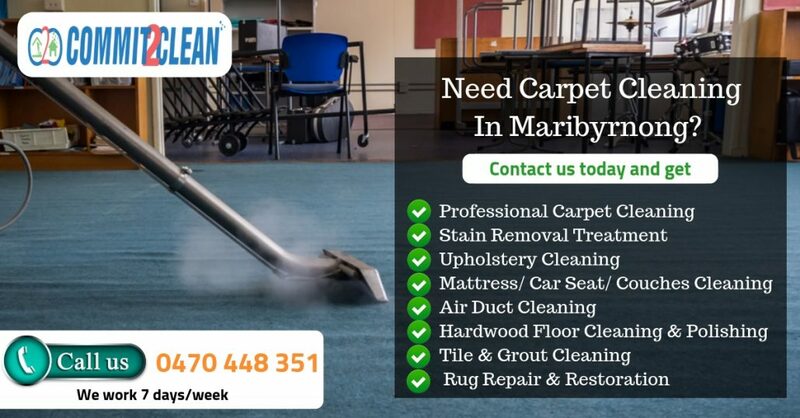 Are you looking for the Best Carpet Cleaning Maribyrnong? Our carpet cleaning in Maribyrnong is a reliable service, aimed at ridding your rugs and carpets from all manner of dirt, spills and stains. Our staff have access to a range of fantastic, high-tech tools and cleaning equipment – allowing us to deliver a wide range of services, including steam and dry cleaning, with ease. We pride ourselves on the quality of our work, and the high calibre of our staff allows us to guarantee great results every time. When you book us for carpet cleaning Maribyrnong you’ll be taking advantage of some of the finest cleaners in the industry – all of whom boast a full training combined with years of experience. Commit2Clean is a leading carpet cleaning service provider for professional carpet steam cleaning solutions which is most suitable for either home or business. Our cleaning machines are top-of-the-range commercial products and our cleaners are fully-trained and insured professionals. We pride ourselves on providing the best 6-step carpet steam cleaning services at your convenience and strive to meet and exceed your every expectation. If you are looking for healthy, clean and vibrant carpets for this season of the Holidays then please give us a call at 0470 448 351 to schedule your carpet clean today! Commit2clean: We are leading cleaning service company in Maribyrnong, going that extra mile to deliver the best service carpet cleaning, end of lease cleaning, upholstery cleaning and after builders cleaning.